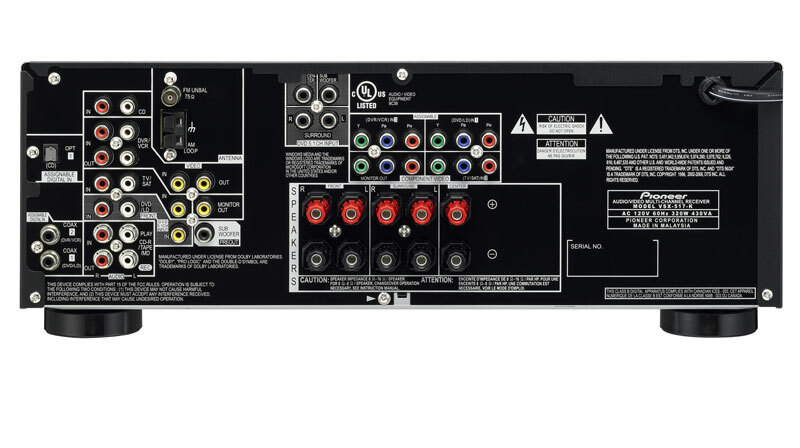 Question about wiring my Bose sound system to a Pioneer Receiver.? Could you guys offer your opinion as to whether I did this correctly or not? Update: There are 10 terminals total on the back of the receiver. 4 total for the front speakers 4 total for the rear And 2 total for the center. And there is a subwoofer output, but it’s for a ‘jack’ and my sub doesn’t have that kind of hookup. On the back of the sub there are four slots total. Two output... show more There are 10 terminals total on the back of the receiver. And 2 total for the center. And there is a subwoofer output, but it’s for a ‘jack’ and my sub doesn’t have that kind of hookup. On the back of the sub there are four slots total. Two output slots and two input slots. Currently from the two output slots I have a set of wires going to the ‘front’ terminals on the receiver. The input slots on the sub I have all 4 of the speakers going in. The front and back left are wired together and stuck in one slot and the same for the other side. I also should add that this sub has no external power supply. It’s just a box about a foot high and 8 inches wide with a open ‘slat’ at the top. You are exactly right, it is an Acoustimass 3 Series III. I actually went home at lunch and looked at it. I called Bose and they said that I should not wire it the way i've described , that it will overheat the Acoustimass, cause distortion, and blow my speakers. They said the same thing you did. Which is to wire the rear speakers directly into the receiver (Pioneer VSX-517). I think the reason they wouln't play last night is because I had to splice in about 5 extra feet of speaker wire for each speaker to reach the receiver and all I had was some 24 guage wire when it requires 18 or above....so I am going to pick up some good wire tonight and try it again. Does everyone agree that this is the best course of action?? Update 6: I figured it out.....it's called X-Stereo!!! Plays all the speakers as if they were the fronts.....had to call Pioneer but I got it figured out!!! Yee haw!!! Best Answer: This is a great question. Very creative solution, by the way, but you are wiring it up wrong. This is understandable as Bose speakers are a little different and are a common cause for confusion. I am going to guess the Bose Subwoofer has the wire connections to drive only the front two speakers, hence your neat trick of combining the back speaker wires into them? I guess this as I have a Bose speaker system, and that is how mine is. First we will clear up some terminology: What you are referring to as a sub, is actually a Bose Accoustimass module, and not a sub at all. The difference is that a modern sub as commonly referred to will have its own built in amplifier, which is why your receiver drives it with the RCA jack, and not speaker wire terminals. So, your original wiring was correct: Take the front left and right out terminals from the receiver and connect to the Accoustimass module, and then wire that on to the front left and right cubes. Wire your rear speakers to the receivers "surround" left and right out. Be careful here, as it sounds from your description like you have a 7.1 receiver, which means it will have "surround back" speaker outputs as well. You should not use these, and there is a setting in the receiver to turn them off. What is missing in this layout is a center channel front speaker, and a sub. Both are optional, and you can get by without them, but they will improve your over all sound a lot, so drop hints for christmas and birthday. So why were your back speakers not playing? Most likely is that you were playing a CD or a regular TV channel, where there are no surround channels delivered. Digital sound from a DVD palyer, sattelite or cable box, needs to be supplied to your receiver, and your receiver will need to be set into an auto mode to detect this and play it. You can also force stereo sound to play from all the speakers with settings on the receiver. My denon receiver calls this "all speaker stereo" and then there are also the effects, like hall, jazz, rock arena etc. Be aware that this will be an expensive changeover. I can not find a harness available for this vehicle yet. The GM radios control all of the chime features in your car, and the onstar is integrated through the radio as well. For almost the entire 2000 + year model GM vehicles, it costs an extra $100-$150 for aftermarket integration harnesses and modules just to replace the radio. Factory radios are becoming more entwined with the vehicle computers and wiring, and becoming more difficult and more expensive to replace. How many inputs and outputs are there on the sub? I'm pretty sure you need to run the speaker out puts from your receiver to the sub for all channels, then from your sub to your speakers. As far as the rear not playing when you hooked them to the receiver, if you had it in "stereo" mode, they wouldn't have played. You would have to switch to a multi-channel surround format, such as DolbyProLogic2, which takes stereo signals and coverts them to surround. Just picked up a 2008 Chevy Impala with out the Bose sound system? Bose Acoustimass 6 series iii with Onkyo receiver set up? Which is best surround sound systems? I have a Pioneer VSX-817-K Home Theater Receiver......speaker hook-up? Which company is better for home theatre systems - Bose, Sony, Onkyo or any other?